What is scientific notation ? Definition and examples. 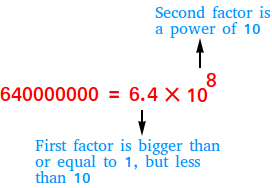 Notice that when a number is written in scientific notation, it is a product of two factors. Notice also that the first number can be equal to 1. However, the second number cannot be 10. The following numbers are written in scientific notation. Scientific notation provides a way to write numbers using powers of 10. When a number is in scientific notation, you can know the size of the number without having to count digits. For example, if the exponent of 10 is 3, the number is in the thousands. If the exponent is 6, the number is in the millions.